These beautiful embroidery hoops from Klass and Gessmann, Germany, have a stand that you sit on, leaving hands free to work on your embroidery. They are sometimes known as 'fanny frames'. The hoop can be turned, or flipped up to access the back of the work, and the height can be adjusted. 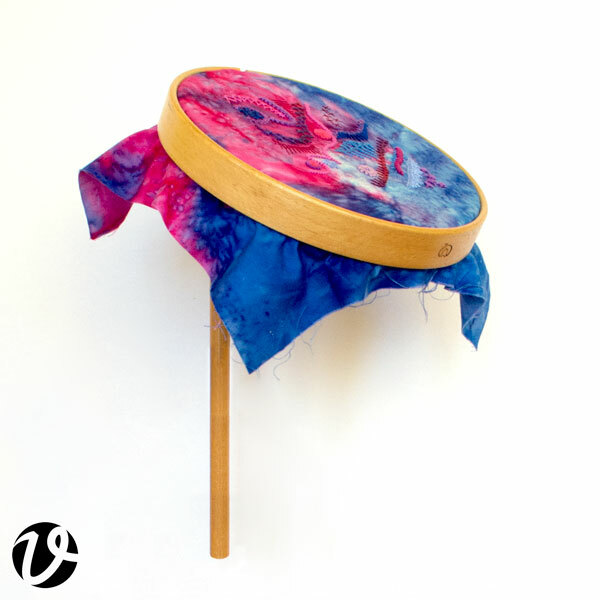 Made from gorgeously smooth finished wood, this is a hoop of lovely quality. It is a deep hoop (approximately 2.5cm/1inch) which gives it excellent stability and strength. Some similar, but inferior, products have plastic parts. These Klass and Gessmann hoops and stands contain no plastic; only quality wood and metal. The base sits flat on flat surfaces, and has no fixtures protruding from the bottom of it to make it wobble. Whichever size you have, they all work with the one stand, so you can easily interchange different sized hoops. The stand, or base section, is adjustable from about 36cm to 48cm high. The kidney shaped section goes under your leg, to stabilise the whole stand. It can go in between your legs, or under them from one side. If you are large in the torso, you can just adjust the height so it sits comfortably around your body. Or move it further away from you. You don't need to have it very close, as you can stabilise it under your leg further away from you if you prefer. Some people use these on the table and stand to work with it. Just another option when can't or don't want to sit any longer! You will need to purchase a hoop (or more than one) AND a stand (base section) for this system to work. You cannot purchase JUST the hoop, as they come on a stick/dowel which inserts into the base section which is purchased separately. You can choose the hoop sizes that are most useful to you to go with your stand. I use one of these hoops and stands, and I LOVE it! NB: embroidery and hoop binding NOT included with product. Shown for illustrative purposes only. 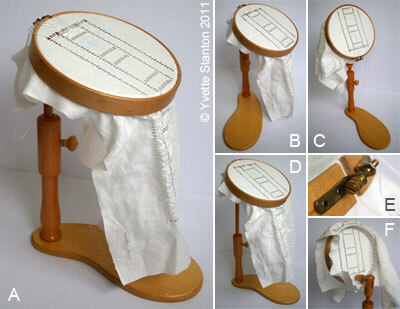 Fig A: Embroidery stand in use. Fig B: Hoop turned to side. Fig C: Hoop turned 90 degrees and flipped right up. Fig D: Extended to full height. Fig E: Can be tightened with a screwdriver for extra strong tightening. Fig F: Hoop flipped up to allow access to the back of the embroidery. The inner hoop has been bound. Hoop with dowel attached for insertion into base. Stand, or base, for hoop with dowel to be inserted into. This hoop comes with a dowel attached that is to be inserted into the stand/base. Without the stand, this hoop will not work properly. This stand is to go with the hoops above. It is a necessary part of the system for them to work properly.